World demand for natural and synthetic graphite (including carbon fiber) is forecast to expand 5.8 percent annually to 4.2 million metric tons in 2018, valued at $30 billion. China will remain the largest and fastest growing market. Synthetic graphite will continue as the largest volume segment, while carbon fiber will grow the fastest. 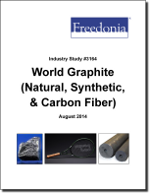 This study analyzes the 3.2 million metric ton world graphite industry. It presents historical demand data for 2003, 2008 and 2013, and forecasts for 2018 and 2023 by type (natural, synthetic), market (e.g., metallurgy, mechanical products, refractories, batteries), world region, and for 16 countries. The study also considers market environment factors, details industry structure, evaluates company market share and profiles 36 industry players, including SGL Carbon, GrafTech and Tokai Carbon.